﻿ Harry Potter DB - Harry Potter Trivia, Harry Potter Merchandise and much more! Coloring and Creativity Book for Fantastic Beasts and Where to Find them. Fantastic Beasts and Where to Find Them T-Shirt A “fantastic beast” with wings highlights this cool Fantastic Beasts t shirt! 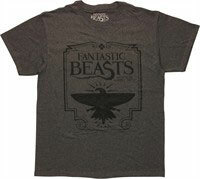 The Fantastic Beasts and Where to Find Them T-Shirt is charcoal. It features a black, flying creature below the title logo for the movie Fantastic Beasts and Where to Find Them , a spin-off from the J.K. Rowling book and the Harry Potter series, framed by an old-fashioned laurel pattern! Newt, Tina, Queenie, Jacob, and many more in this comprehensive character guide to Fantastic Beasts and Where to Find Them. Save your place in your Magiczoology textbook with this 7-inch tall x 2-inch wide double-sided Fantastic Beasts and Where to Find Them Newt Bookmark with classic-style tassel. 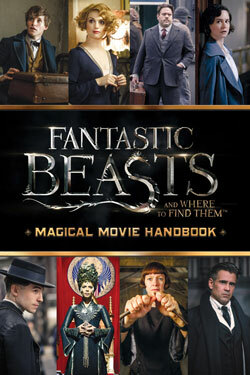 It features an image of Newt Scamander from the film. Ages 13 and up. 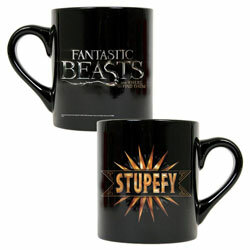 Fantastic Beasts And Where To Find Them Stupefy Black Mug from Warner Bros.
Every Harry Potter fan has their own favorite spell, and what better way to celebrate it than with a clever mug? Inspired by Fantastic Beasts and Where to Find Them, this stylish black mug features Stupefy, the easy-to-remember stunning spell, in a beautiful 1920s style to match the film’s setting. Your morning coffee will be that much more magical with this mug at hand. This black ceramic mug holds 20 ounces of your favorite hot or cold beverage and is microwave and dishwasher safe. Own this Horcrux Locket Replica. It’s shrouded in mystery! Based on the actual prop used in Harry Potter and the Deathly Hallows. Such a beautiful addition to your magical collection! Collector display box included. Shrouded in mystery– and perhaps just a tad of the Dark Lord’s soul– this Harry Potter Horcrux Locket Replica will make a beautiful addition to your magical collection! 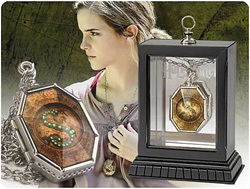 Based on the actual prop used in Harry Potter and the Deathly Hallows, the stunning locket measures 5 3/8-inches tall x 3 3/4-inches wide and includes a collector display box. It can be yours! The magic of Harry Potter and the fun of the LEGO world are now available in one incredible book! 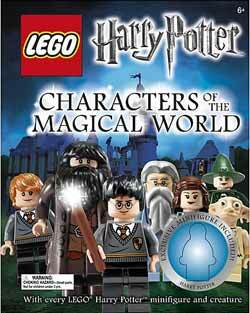 Since it was first introduced in 2001, LEGO Harry Potter has been one of the LEGO Group’s most popular themes. This fantastic encyclopedia gives readers an up-close look at the characters the LEGO Harry Potter universe! The all-inclusive 144-page book wouldn’t be complete without an included exclusive LEGO Harry Potter mini-figure who will it be? Ages 6 and up. Cast a spell from your desk or shelf with this Hermione Granger Head Knocker! Bobble head presents Hermione in her Hogwarts uniform, wand at her side! Detailed Harry Potter base features the Hogwarts crest. Cast a spell from your desk or shelf with this Harry Potter Hermione Granger Head Knocker! 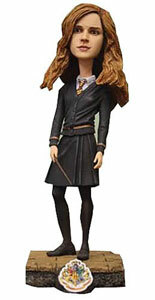 Presenting Hermione in her Hogwarts uniform with wand at her side, the highly detailed bobble head stands approximately 8-inches tall on a Harry Potter base that features the Hogwarts crest. Order yours today!